We have parted our infrastructure into several units and one of them is warehouse wherein we keep a huge stock for furnishing urgent and quick requirements of the clients. Our payment procedures are hassle free, safe, and legal. We do not impose hidden charges while creating the invoice and ensure your money is transferred securely from you to us. Rajshree Overseas is leading manufacturers, exporters and suppliers of Copper Alloy Couplings. We offer a wide variety of copper alloy couplings that are put to different use in domestic and commercial applications. Our copper fittings are available in standard as well as a variety of sizes. 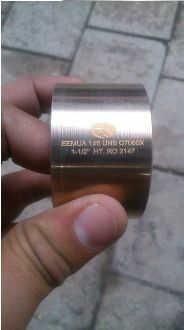 Best Copper Alloy Couplings Manufacturers and Exporters in mumbai india.